On Tuesday, Triple H underwent surgery to repair a torn right pectoral muscle. The injury took place at last week’s WWE Crown Jewel from Riyadh, Saudi Arabia at the King Fahd International Stadium. During the main event featuring DX vs. The Undertaker and Kane, it’s believed that Triple H suffered the pectoral tear during a spot when he was thrown outside the ring. “The Game” announced the news in a tweet that was posted on his official Twitter account. The operation was successfully completed by Dr. Jeffrey Dugas at Andrews Sports Medicine & Orthopaedic Center in Birmingham, Alabama. As of this writing, there’s no official word yet on when Triple H could be back in the ring to compete again but the expected timeline is that he’ll be on the sidelines from 5-9 months. It’s an unfortunate injury due to the rumors going around that he could face Batista at WrestleMania 35 on Sunday, April 7, 2019 in East Rutherford, NJ at MetLife Stadium. Obviously, this injury may have put these potential plans in jeopardy. 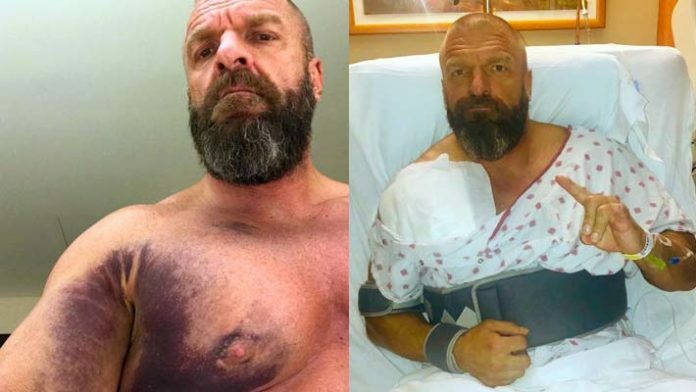 We wish Triple H a speedy recovery.